Ribbon technology applied to live sound. 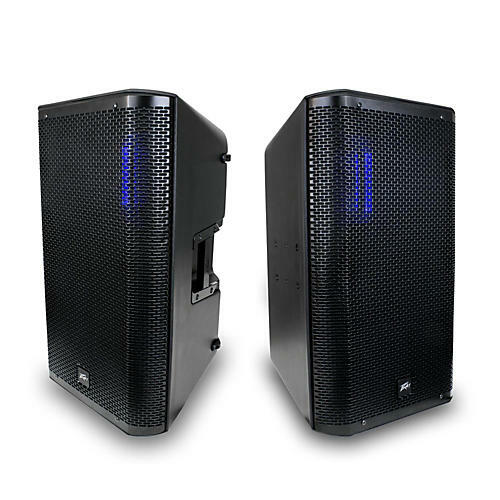 This package includes a pair of Peavey's revolutionary RBN112 active PA speakers. The RBN 112 enclosure is a top quality, ultra-reliable loudspeaker. Unique to the RBN 112 is Peavey’s world-class ribbon driver. Used in studio environments for decades, Peavey has developed a method for applying this high-quality sound technology to live applications. The result is crystal-clear audio that traditional compression driver cannot rival. To match the incredible high-frequency performance of Peavey’s ribbon driver, the RBN 112 enclosure is equipped with dual-voice coil neodymium Scorpion® speakers which feature Peavey’s exclusive field replaceable basket technology. Incorporating modern digital signal processing, the RBN™ series features two XLR/1/4" combination inputs, a 3.5mm input, and a mic/line level selection. Each input features digital infrasonic high-pass filters, a 9-band graphic EQ, and delay. Each output features a sophisticated compressor/limiter and fourth order high-pass/low-pass filters for crossover function and external subwoofer incorporation. RBN enclosures feature an internal temperature monitor combined with a variable speed cooling fan, plus level and clip indication to ensure optimal performance. Completely user-friendly, the speaker system features internal presets built into the DSP, allowing users to quickly select the speaker’s application or orientation via the LCD on the rear of the enclosure. A pair of powered speakers featuring ribbon technology for high end response. Order today.